GENEVA, May 22, 2014 – Geneva-based human rights group UN Watch presented its annual Moral Courage Award tonight to Canadian cabinet minister Jason Kenney, one of the country’s most influential national figures, a decision that drew strong praise from the Dalai Lama, the Nobel Peace Prize Laureate and Tibetan spiritual leader who sent a special envoy to the Geneva ceremony attended by UN officials, ambassadors, and community leaders. “UN Watch honors Minister Kenney for demonstrating the courage to lead in upholding the founding principles of the United Nations, and defending the true principles of human rights,” said UN Watch executive director Hillel Neuer. 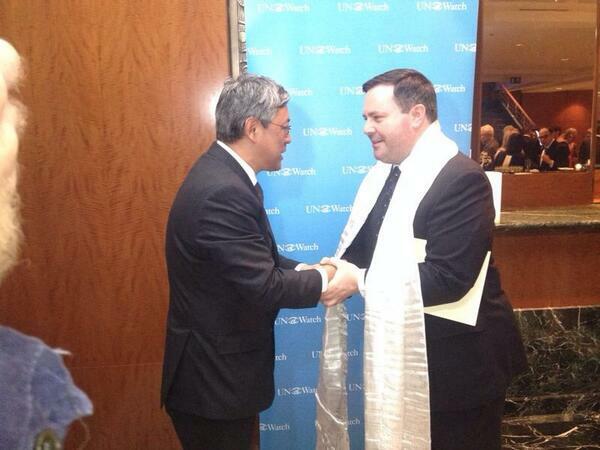 The Dalia Lama sent special envoy Tseten Chhoekyapa to honor Jason Kenney as he received UN Watch’s Moral Courage Award tonight in Geneva. GENEVA, May 22, 2014 – The Dalai Lama, a former political prisoner and numerous other human rights and community leaders sent congratulatory messages to Canadian cabinet minister Jason Kenney upon receiving tonight’s 2014 Moral Courage Award from UN Watch at a Geneva ceremony. Click here to read messages from former Chinese political prisoner Rebiya Kadeer, the Canadian Friends of Burma, African Diaspora Association of Canada, Vietnamese Canadian Federation, All Pakistan Minorities Association, World Uyghur Congress, and Federation for a Democratic China. Other messages follow below. UN fact-finding mission to Tibet? I just received the press release below from a Tibetan activist group. The long-suffering Tibetan people desperately need the world’s help. Sadly, however, the chances that the U.N. will send a fact-finding mission to investigate China’s abuses in Tibet are between zero and nil.